SiGlaz Intelligent Defect Analyzer (IDA) software automatically analyzes wafer defect maps and identifies defect signatures resulting from equipment failures and process excursions. IDA provides several algorithms for recognizing spatial signatures, including pattern matching, zonal analysis, repeater analysis and object analysis. When the defect signature is characterized by a distinctive shape, it is usually well-suited for object signature analysis. IDA software defines an object as a group of defects that lie within a defined spatial proximity. Each object may be characterized by attributes that describe its size, shape, orientation and location. An object signature is an object whose attributes match a set of rules defined by the user. IDA Advanced Signature Analyzer utilizes the object signature recognition process, which is comprised of four sequential steps: 1) identify primitive objects; 2) filter primitives using object rules; 3) merge primitives into “super objects;” 4) filter “super objects” using object rules. The first step in the process is to identify primitive objects or clusters based on the proximity of the defects to neighboring defects and based on the number of defects in the cluster. The identification process includes a line extraction algorithm that will group the cluster defects that are in a straight line. An example of this line extraction function is included in the sample signature analysis results. Once the clusters are identified, the recognition algorithm creates a shape model for each cluster based on its defect density distribution. The algorithm extracts spatial parameters from the shape to define the primitive object. Then the recognition function filters the identified primitive objects by comparing the object’s spatial parameters to a set of object rules that are stored in the object library. The third step in the recognition process combines primitive objects into “super objects” when they meet specified criteria (for example, proximity, orientation, X/Y coordinate value). The density shape model is then applied to the “super objects.” The algorithm extracts another set of spatial parameters from the “super object” shape. Then the recognition function filters the “super objects” by comparing the spatial parameters to a set of “super object” rules that are stored in the object library. An example of a wafer edge scratch is shown in Figure 1. The scratch is a highly elongated cluster, parallel to the wafer boundary. A set of rules for the wafer edge scratch is trained into the IDA Advanced Signature Library containing the specified attributes. In this example, the object identification function applies the line extraction algorithm to each defect cluster, which helps to suppress background noise. Figure 2 illustrates three examples of wafer edge scratches. The IDA Advanced Signature Analyzer highlights the scratch signatures in green and circles them with a boundary. The analysis in the center and right boxes illustrates how the advanced signature analyzer identifies the scratch in the presence of background noise, ignoring clusters that do not meet the object rules. When an IDA recipe uses the Advanced Signature Analyzer to identify a signature, a specified classification number is assigned to the defects in the signature. An example of the sparse center line is shown in Figure 3 (highlighted in green). 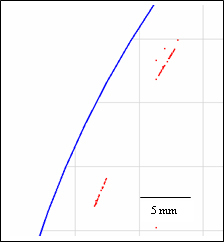 The sparse center line occurs on monitor wafers. The signature is comprised of at least eight aligned defects. The sparse line passes within a few millimeters of the center of the wafer. - Distance from object center to wafer center (less than 20mm). A set of rules for the sparse line is trained into the IDA Advanced Signature Library containing the specified attributes. In addition, the rules also apply the line extraction algorithm to each defect cluster. Figure 4 illustrates two examples of sparse lines. The IDA Advanced Signature Analyzer highlights the sparse line signatures in green and circles them with a boundary (in the examples above the boundary has been turned off to make the defects in the signature visible). The analysis illustrates how the advanced signature analyzer identifies the scratch in the presence of background noise. When an IDA recipe uses the Advanced Signature Analyzer to identify a signature, a specified classification number is assigned to the defects in the signature. An example of a concentric circle is shown in Figure 5. The circle is comprised of several elongated clusters equidistant from the center of the wafer and. parallel to the wafer boundary. The object signature attributes that are specified for primitive objects that make up the concentric circle are listed below. These primitives are then combined into a “super object;” the signature recognition algorithm extracts the parameters from the “super object” and compares them to a second set of rules in the object signature. 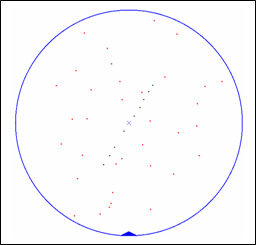 If there are multiple circles in the same KLARF, the user assign each circle a separate cluster number. Figure 6 illustrates two additional examples of KLARFs with concentric circle signatures. The IDA Advanced Signature Analyzer highlights the circles signatures in green and circles them with a boundary (in the examples above the boundary has been turned off to make the defects in the signature visible). 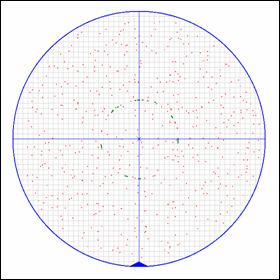 The analysis illustrates how the advanced signature analyzer identifies the circle in the presence of background noise. All defect signatures are identified using the same object rule. In the example on the right, there are two concentric circles. The user may assign a different cluster number to each circle. SiGlaz IDA software provides the user with a number of tools to define and extract defect signatures from inspection equipment results files. SiGlaz has recently released a new recognition algorithm called Advanced Signature Analyzer, which provides the user with an easy-to-use tool that will enable him to accurately identify cluster-based defect signatures. The recognition algorithm is based on parameters that are extracted from a density shape model of the defect cluster. In addition, the algorithm includes two novel features that improve signature recognition accuracy: a line extraction function that isolates straight lines within defect clusters; and a “super object” function that allows the user to combine primitive objects into complex objects. The Advanced Signature Analyzer may be used in conjunction with other IDA recognition algorithms (e.g., zonal analysis) to provide high levels of accuracy and purity. Please refer to SIGLAZ INTELLIGENT DEFECT ANALYZER - Advanced Signature Analyzer for Pdf file of this page.